Follow @DistanceCovered on Twitter for regular FM updates, tactical assistance or general help. 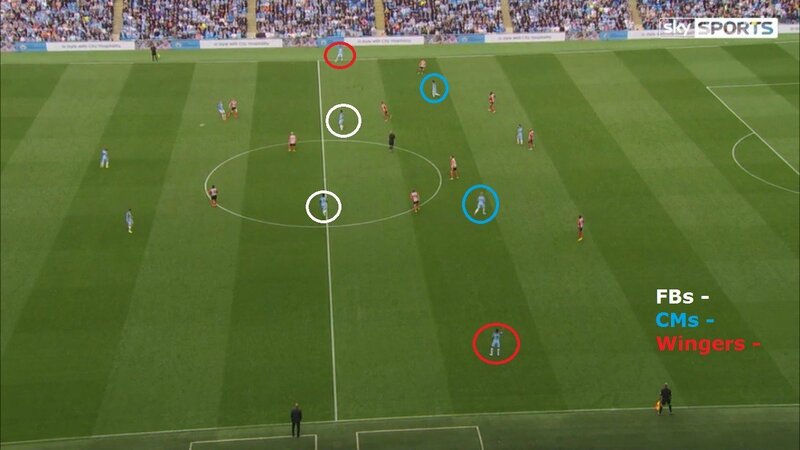 At Manchester City, Pep Guardiola has adopted a similar approach to the tactic he found so successful at Bayern. The tactic is focused on maximising the dribbling ability of Sterling and Sane, the poaching nature of Sergio Aguero, and the creative input of Kevin De Bruyne and David Silva. Often this season, Clichy and Sagna have acted as inverted wing-backs with Sterling and Sane playing as wide as possible to create 1v1 situations, as demonstrated in the image below. As shown above, Pep strives to utilise the quality of his 10’s, David Silva and Kevin De Bruyne, as by Pep employing his full-backs as central midfielders (IWBs), this then allows Silva and De Bruyne to move forward and operate in the half-spaces between the lines of the opposition’s midfield and defence. Both Full-Backs moving centrally to play as Inverted Wing-Backs. Both CM’s then moving forward to play as AMC’s. Both Wingers playing very wide to create 1v1s. After testing out multiple formations to determine which recreates the movements of the tactic best, I finally opted for what is pictured below. The full-backs are obviously set as IWBs so that they operate centrally. In terms of the DLP, I tested the Half-Back a few times and the role wasn’t having the desired effect; it was too defensive, forced my CBs too wide and didn’t have the controlling influence that Pep requires from his pivot. Regarding the CBs, the immediate perception is that they should be BPDs, which I’d agree with and did try. However, I’m playing with 3 playmakers in midfield and two IWB’s, and all of these have the instruction of More Risky Passes, so in order to retain the ball more effectively, I eventually opted to change them to CBs. In terms of the two APs, this was fairly clear to me, as Pep wants both Silva and De Bruyne to operate in the holes between the opposition’s midfield and defence. I would’ve added Get Further Forward to those APs, but for some reason the tactic creator doesn’t allow this on a Support duty, and when they’re on Attack duty the tactic is prone to becoming unbalanced. Now for the Wingers, these are vital attacking outlets to the tactic, so they’re on Attack duty as I want them to dribble more, play very wide and cross from the byline after beating opposing full-backs 1v1. I also added an additional player instruction to my Wingers to aim low crosses to the centre, which is where Aguero will often be to finish. Aguero will play as an AF, as I want him playing highly and on the shoulder of the opponent’s last defender to utilise his high anticipation when attacking crosses. Now for the team instructions, pictured below. I opted for a Very Fluid team shape and Control mentality as I felt these were fairly obvious. Pep is a very modern manager in terms of wanting every one of his players to contribute to every phase of the game, as well as remaining compact and counter-pressing when possible, as pictured below, so Very Fluid is ideal. The Control mentality is effectively what Pep’s philosophy is about, ultimate dominance and being aggressive with and without the ball. I’ve set my tempo as Normal, and appreciate that this is probably open to debate. As tempo is purely a with-the-ball setting, I didn’t think Higher was appropriate, as Pep likes his players to be patient and make good decisions on the ball and this is less likely to happen with an increased tempo. 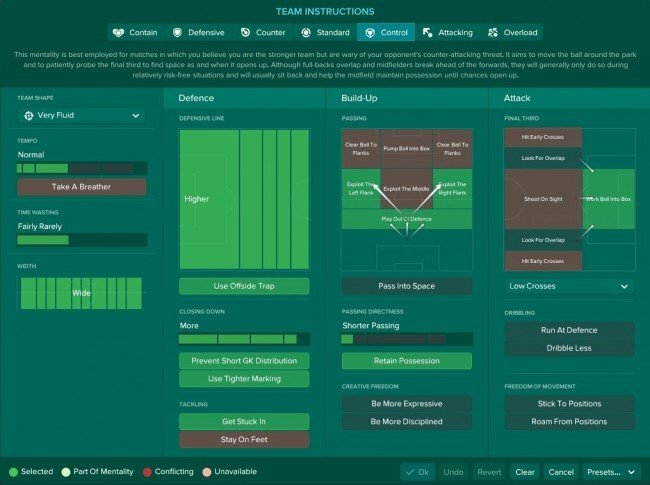 I have tested Lower tempo with the tactic and although it does work, I prefer my players to have the option of speeding up play when appropriate, so I’ve opted for Normal. Manchester City play with a Higher line so that the game is played far away from their goal, however this can sometimes change to Deeper if the opponent is defending with a low-block. Closing Down More, Prevent Short GK Distribution, Use Tighter Marking and Get Stuck In all interlink in my experience to form aspects of counter-pressing. They empower your players to position themselves close to opponents in order to win the ball back and be aggressive when doing so. 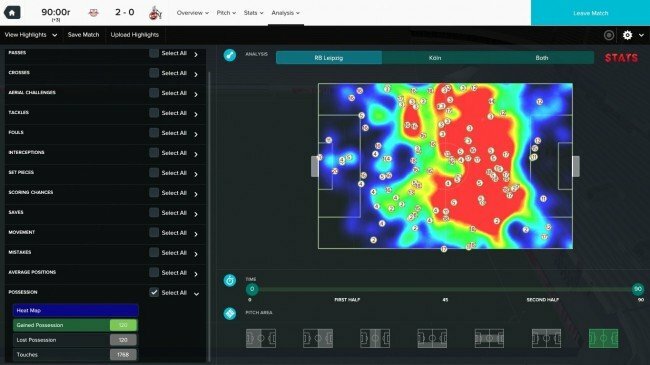 Regarding build-up play, it’s imperative that your team tries to Exploit The Flanks as this is where most attacking penetration will occur, and using this setting will encourage your playmakers to pass to your Wingers. Finally, Work Ball Into Box, Shorter Passing and Retain Possession all interlink to develop a patient approach focused on dominating the ball and taking advantage of an opportunity when it arises. A further and more detailed overview of how the tactic works in FM17 can be viewed in the video below featuring match engine footage and examples of the goals that are often scored when playing with this tactic. The type of dominant performance that the tactic can produce is shown below in my RB Leipzig save, in which with I clearly formulated a large number of shots with 50% of them being on target, as well as not conceding a single shot on target from the opposition. Finally, pictured below is my season summary after using the tactic in my RB Leipzig save from December onwards. 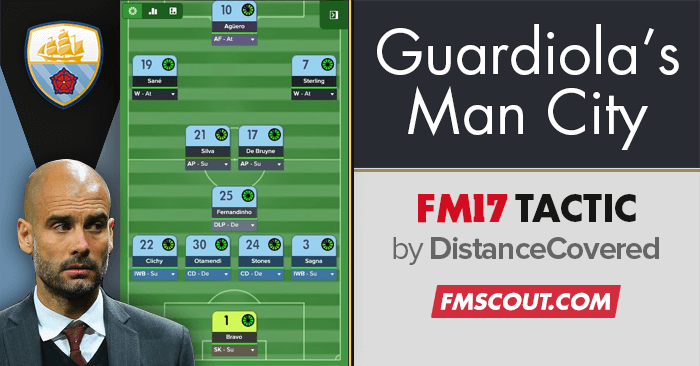 Enjoy the tactic, and for more, Follow @DistanceCovered on Twitter for regular FM updates or help. Tactics Enthusiast. 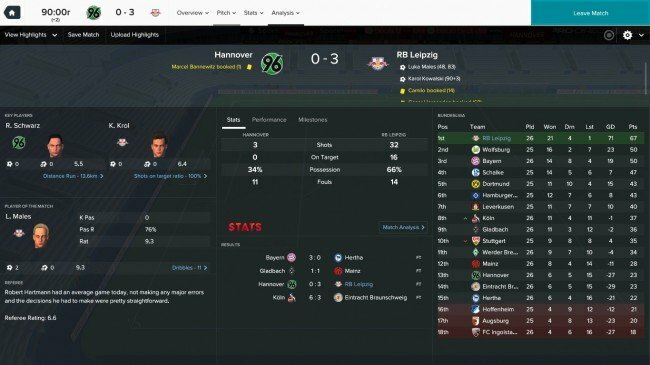 FM17 fanatic. Follow @DistanceCovered on Twitter for more. Hey man gonna try this tactic, but what about OI's, general training and match preparation training? @Klashman: DC has published a couple of tactics and doesn't have a history of theft. 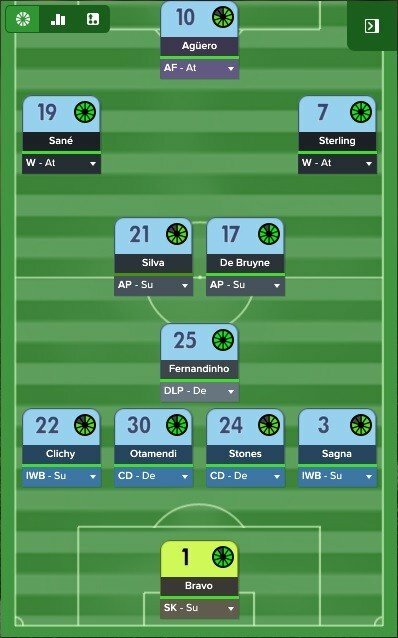 Having identical formation happens quite often, especially when trying to recreate a tactic from the same manager. Besides, formation no longer has a decisive impact; it's all about roles and duties now. Thank you for admitting your mistake, and please accept my apologies for the delay in publishing your tactic; will get on it today. Do u have any oi's? Training ? Or do u leave oi to assistant manager ? @Klashman @TheFMEditor what are you both talking about? I've just had a look at the tactic you claim I've stole from you and it's completely different? 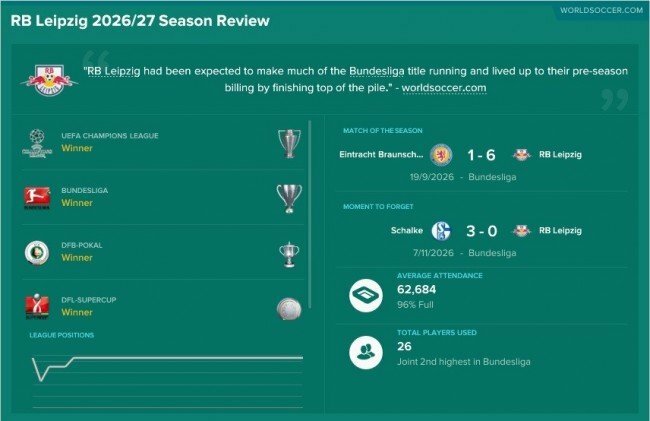 Just because we've both tried to recreate Guardiola's Man City, doesn't mean that our systems are identical. Mine is completely different and I've never saw yours before, so I created mine completely based on my own tactical knowledge, research and FM experience. Also, thank you @j6k4 for seeing sense and realising that my system is completely different to Klashman's. Well, I just compared the roles and team instructions and quite a few of them differ so I wouldn't say they are exactly the same. That's how I see it anyway..